Some crime fiction possesses a cold, deep, gripping darkness that, instead of coming from the story itself, emerges from the way the narrative is written. 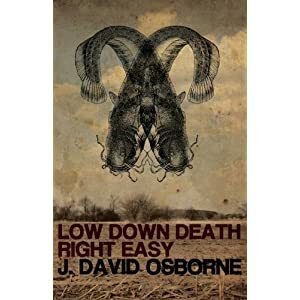 J. David Osborne's Low Down Death Right Easy is a prime example. The story is full of meth, broken lives, violence, and gloom. Written by anyone else, it would be an interesting tale, but in Osborne's capable hands, the intertwined stories becomes a sinister, beautiful monster that swallows the reader and spits him or her back out, covered in mud and with an altered consciousness. I could give you a very detailed synopsis of Low Down Death Right Easy here, but that would take a lot of fun out of the book. In fact, the first third of the novel feels like Osborne has you by the throat, dangling over the story and watching vignettes of his characters as they go about their lives, but never entirely sure of where the action is going. What you need to know is this: Arlo and Sepp are brothers and, in the infinitely noir and too-real Oklahoma town the author depicts, feel a fraternal love for one another that ends up feeling like the only light in a very dark tunnel. The brothers find a body and think they can use it to get something. However, there's a story behind the corpse: it belongs to a man who was killed for an awful crime he didn't commit. Soon the stories and agendas of every character will collide, and that's when the fun really starts. The first thing that makes Low Down Death Right Easy a must-read is Osborne's prose. He can take you into a diner, let you know how a character is feeling, inject some action, describe the place and the people who work there, and pull you back out using one third of the words I used in this sentence. More than writing, Osborne carefully picks words to construct short, vital sentences full of meaning. Despite this outstanding economy of language, the narrative also contains some very elegant passages that come from the author's attention to detail and obvious knowledge of the world he describes. Besides the writing, the story itself places this novel on the list of tomes that need to be on the shelves of any crime fiction lover. The requisite violence, drugs, and death are all there, but there's more. Just like he does with every sentence, Osborne removes the clutter that sometimes weighs down narratives in this genre. The result is a tale that, without unnecessary explanations or decorative writing, brings in a plethora of themes. This book is about meth and crime, but it's also about making decisions, feeling trapped, working like a mule, being forced to put up with people, loneliness, noodling, cigarettes, despair, towns that have seen better days, alcohol, and broken lives. Sometimes mysterious, sometimes vicious, and always engaging, Low Down Death Right Easy is a unique take on the crime novel that will satisfy readers who like their fiction as murky as a river after heavy rains. J. David Osborne has a unique voice, but for those who haven't read him yet, here's a good way to describe him: Daniel Woodrell, James Ellroy, and Cormac McCarthy all wrapped into one, stripped to the bones, and given a new voice.